The Hawaii Senate is the upper house of the Hawaii State Legislature. It consists of twenty-five members elected from an equal number of constituent districts across the islands and is led by the President of the Senate, elected from the membership of the body, currently Ron Kouchi. The forerunner of the HawaiiSenate during the government of the Kingdom of Hawaii was the House of Nobles originated in 1840. 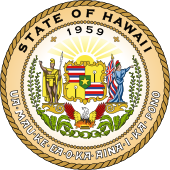 In 1894 the Constitution of the Republic of Hawaii renamed the upper house the present senate. Senators are elected to four-year terms and are not subject to term limits. Like most state legislatures in the United States, the Hawaii State Senate is a part-time body and senators often have active careers outside government. The lower house of the legislature is the Hawaii House of Representatives. The membership of the Senate also elects additional officers to include the Senate Vice President, Senate Chief Clerk, Assistant Chief Clerk, Senate Sergeant at Arms and Assistant Sergeant at Arms. The Hawaii Senate convenes in the Hawaii State Capitol in Honolulu. From 2016 (when Sen. Sam Slom, Hawaii's sole Republican state Senator, was defeated in his bid for reelection) to 2018, the Democratic Party held all 25 seats in the Hawaii Senate. This made the Hawaii Senate the only state legislative chamber with no opposition members (excluding the officially nonpartisan Nebraska Legislature). It was the first time since 1980 (when the Alabama Senate and Louisiana Senate were all-Democratic) that any state legislative chamber had been completely dominated by a single party. ^ Appointed to seat on January 7, 2013 by Governor Neil Abercrombie after Shan Tsutsui was appointed to be Lieutenant Governor. The Hawaiʻi State Senate has been meeting at the Hawaiʻi State Capitol in downtown Honolulu since March 15, 1969. Previous to the decision of Governor John A. Burns to build the new Capitol building, the Hawaiʻi State Senate met in ʻIolani Palace. ^ National Conference of State Legislatures. "2014 State Legislator Compensation | Living Expense Allowances During Session". Retrieved November 10, 2014. ^ Cocke, Sophie (November 9, 2016). "Chang ousts Slom to create nation's only all-blue Senate". Honolulu Star-Advertiser. ^ Cathy Bussewitz, If Democrat wins seat, Hawaii could be first state in U.S. with one-party rule, Associated Press (October 23, 2016). ^ Osher, Wendy (January 7, 2013). "Governor Appoints Gilbert Keith-Agaran to Maui Senate Seat". MauiNow.com. Retrieved February 3, 2013. ^ "State Senate chooses Donna Kim as new president". Honolulu Star-Advertiser. December 28, 2012. Retrieved February 3, 2013. ^ Dayton, Kevin (May 5, 2015). "Kauai's Kouchi replaces Kim as Senate president". Honolulu Star-Advertiser. Retrieved May 5, 2015. ^ Medina, Andrei (January 16, 2013). "Donna Kim makes history as first Filipina-American Hawaiʻi Senate President". GMA News. Retrieved January 19, 2013. Hawaiʻi Senate Vice President Donna Mercado Kim will make history on Thursday as she is installed as the first Filipina-American State Senate President. ^ "Senator Donna Mercado Kim's Biography". Project Vote Smart. One Common Ground. 2012. Retrieved January 19, 2013. This page was last edited on 13 March 2019, at 22:49 (UTC).